I had the pleasure of meeting Ja’net Wyatt with PoP! Balloons at an event put on by Playdate Connection over a year ago at a local indoor playground. She had created an awesome Mickey Mouse balloon display that drew a lot of attention! She introduced herself. She was polite and outgoing with a great smile. I recently had a little time to interview Ja’net and see what makes her tick. She is nothing short of amazing, like her small business, PoP! Balloons, and the creations they make! 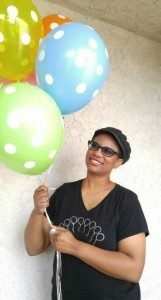 Before Ja’net became a balloon decorator she had acquired her degree in Cinema & Television Arts from CSUN and she had worked on 3 independent films. Having moved from Los Angeles from out of state, her dream was to be a film director. Prior to creating and owning PoP! Balloons, Ja’net worked for ION Media Networks, formerly known as PAX Television, as a long form sales assistant. 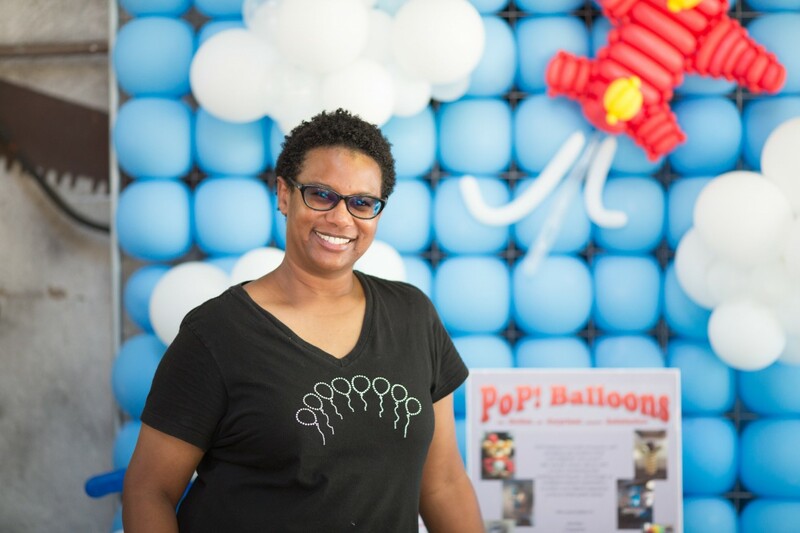 When I asked Ja’net what made her go from her degree and chosen profession to balloon decorating, she said a station manager she used to send titles and tapes to had encouraged her to go into business for herself. The station manager told her “You are too smart to work for anybody.” Along the way she heard similar comments from other people too. Being a creative person all her life doing dancing, acting, drawing comics, and writing, she decided to browse entrepreneur.com one day and came across a business of balloons. At first she wasn’t interested in this billion dollar industry, but decided to do some research. Looking for balloons to practice with, she found a balloon distributor in Glendale called LA Balloons, and they were offering classes! Her first class was a baby shower class that turned into a framing class! She practiced, went to conventions, and the rest is history! The name PoP…well, that comes from the sound balloons make when they pop of course! Down the line she learned how to brand her business and herself, though it’s always a work in progress! When I asked Ja’net how long she had been in business and what her biggest challenge was, she said she started out in 2011. But, she has been working successfully with the public for 4 years. She finds the marketing side of the business most challenging. She compared it to a treasure hunt. Finding clients that will pay her what she is worth when it comes to time, along with the artistic design for the more fancy and beyond basic decor that you can’t get from a mom & pop store or even a corporate store is not as easy as people think. It’s something that she is still learning to conquer. Along the way I took a moment to ask Ja’net what her favorite part of her business is and her answer was “Creating and learning new creations. The business part is simply boring.” With that I just had to know what her favorite creation was, she said, “I like almost everything I create. I am most amused by the skydiving Goofy I created for the homeless shelter.” Being a huge Disney fan myself I was very impressed with this one too!